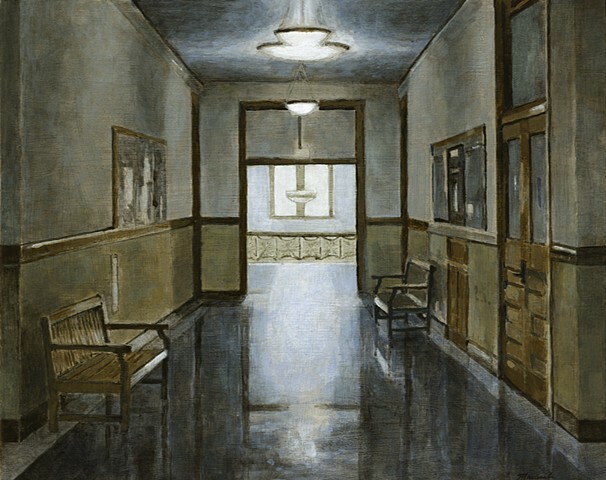 This scene is from a hallway in Schaeffer Hall on the campus at the University of Iowa. At the end of the hall through a doorway, the bright sun illuminates a window frame and reflects off of the aged polished floor. The old woodwork is faded but intensely clean. This space feels quiet and empty but sounds echo off of the hardness of all the surfaces. People approach unseen, then pass by, down a hall, down a staircase, around a corner, through a closed door. The paint brings this space some fluidity and softens the edges, like a still reflection on dark water, waiting for something brave enough to jump in. Available at Iowa Artisan's Gallery in Iowa City.